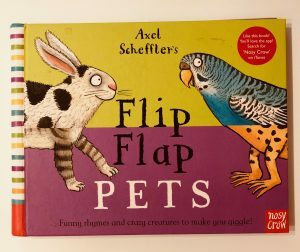 There are lots of books on the market which allow you to mix and match animals to comic effect but this one is our outright favourite. Each double page features a familiar pet such as a cat, a dog, a guinea pig or a bunny. On the right hand side we see a picture of the animal and on the left is the name of the animal and a cute poem which describes what it looks like and what it’s like as a pet. The pages are split in the middle, allowing you to flip over the top or bottom sections to different pages – thus creating new names, poems and creatures. There are 121 combinations in total so there’s lots to keep your little one entertained. 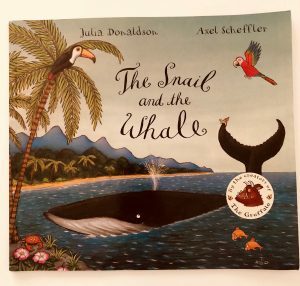 The Snail And The Whale is one of our favourite collaborations between Julia Donaldson and Axel Scheffler. There’s a real sense of adventure but the rhyme is also very calming so it’s perfect for bedtime. The story is about a little snail who longs to travel – but her family thinks she’s a little crazy and don’t understand at all! She’s determined to see the world so she hitches a lift on the tail of a humpback whale. On their magnificent journey the snail sees icebergs and volcanoes, beautiful beaches and strange animals. She is amazed at how big the world is and this makes her feel small and insignificant. 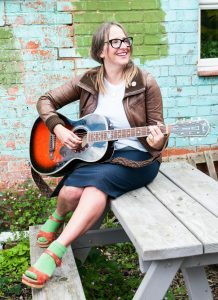 I’m Cat Bateman, a mum of two very energetic & football-mad boys, 11 & 8. I met my husband 26 years ago (I know! I am that old!) and I have a business called Little Folk Nursery Rhymes. I hold weekly sessions singing nursery-rhymes to lovely little customers accompanied by my guitar. I completely love singing and sharing music and am passionate about spreading the word about Type 1 Diabetes as my eldest boy was diagnosed when he was 5 years old. What were your sons’ favourite books when they were small? I will answer all the questions from my memories of what they loved when they were your demographic of 0-5 years – I have totally enjoyed digging these books out and taking another look at them – haven’t been able to get rid of any of them in the constant battle to reclaim the house from the children’s stuff as they hold such gorgeous memories. 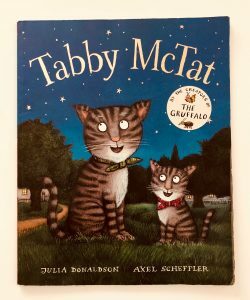 We have been reading Tabby McTat to Ivy since she was about 6 months old and it’s still one of her all time favourites. When she was tiny she was just drawn to the illustrations of the cats (one of them looks a little like ours) but now she’s older she loves the story and knows the little song off by heart! Tabby McTat is a scruffy little street cat who belongs to a busker. He loves his life wandering the streets of London with his owner, and he enjoys singing along when the busker performs. An unlucky chain of events result in the two friends being accidentally separated and McTat ends up living with a girl cat called Sock. Sock and McTat become the best of friends and soon they end up with a small litter kittens. McTat loves his cosy new life but he never forgets the wonderful busker. One day he decides that he simply has to find out what happened to him so he kisses his little family goodbye and sets off in search of his old pal. 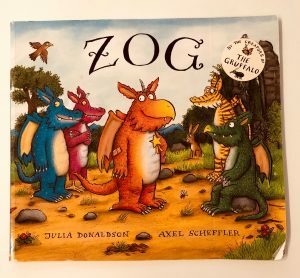 The combination of dragons and girl power make this one of our favourite collaborations between Julia Donaldson and Axel Scheffler. Zog is a big orange dragon who loves going to Dragon School. He’s really enthusiastic about his classes but he just can’t quite get things right. He bumps in to trees whilst learning to fly, gives himself a sore throat trying to roar and accidentally sets his wing on fire whilst attempting to breathe fire. Fortunately each time he hurts himself a little girl appears with a bag of bandages and plasters and she fixed him right up. When he gets to Year 4 the dragons have to learn how to capture a princess. Again Zog struggles until he discovers that his wonderful friend is in fact a princess herself. She allows herself to be captured in order to help him out and Zog gets a golden star from the teacher. She becomes a valuable member of the school, tending to the dragon’s ailments with the help of her trusty medical bag. Today’s book needs no introduction as it’s a modern classic. I’m sure most of you already have this in your child’s library but a collection of children’s book reviews doesn’t seem complete without it! An enterprising young mouse is taking a little walk through the wood when he encounters a number of creatures who are keen to make him their dinner. Thinking on his feet he explains to each of them that he can’t stop because he is off to meet a Gruffalo. 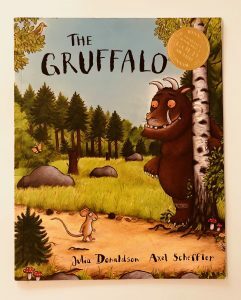 What’s a Gruffalo? the fox, the owl and the snake each ask in turn. As he describes this imaginary, terrifying creature the details become more and absurd. He has terrible teeth, a poisonous wart on his nose, orange eyes and purple prickles all over his back! Scared of the mouses terrifying friend, the animals decide to let him go on his merry way. 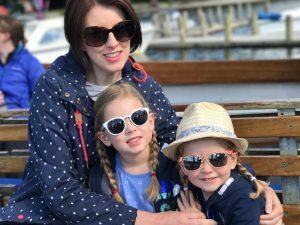 Hi, I’m Julie and I’m mum to two gorgeous girls aged 6 and 4. We live in South Yorkshire in a village on the edge of the Pennines, from where I run my marketing and copywriting business. Which book do you most like reading to them and why? A Squash and a Squeeze by Julia Donaldson and Axel Scheffler is a fantastic book to read to young children. It’s about a little old lady who grumbled that her house was too small, she then met a wise old man who tells her to take in an assortment of animals, culminating in total chaos, as you might imagine. At the end of the book he tells her to “Take them all out” and then she realises that her house was fine as it was. I believe the story is based on an old folk tale or fable and it certainly carries a good message – be grateful for what you have, it is enough. However, it presents this message in a funny and subtle way, which my girls find very entertaining. They love to join in with key lines that are repeated throughout, often putting on a silly voice for the old lady “My house is a squash and a squeeze”. 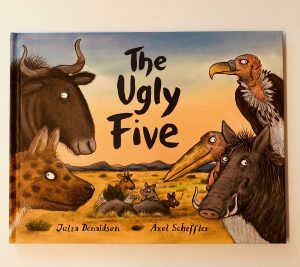 Almost everyone has heard of the Big Five – the largest and most dangerous animals in Africa – but what about the Ugly Five? 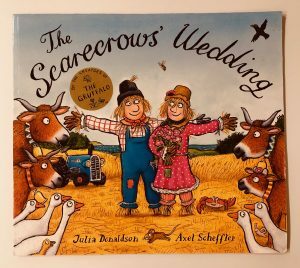 Julia Donaldson shines the spotlight on this lesser known group in this heartwarming story. The lappet-faced vulture, the spotted hyena, the wildebeest, the marabou stork and the warthog are not going to win any prizes for their beauty. With their gnarled faces, distinctive odours and questionable table manners, they repel the other animals they meet. This is a fantastic story which reminds parents and children alike that even at your worst, you are somebody’s whole world and to them you will always be beautiful. 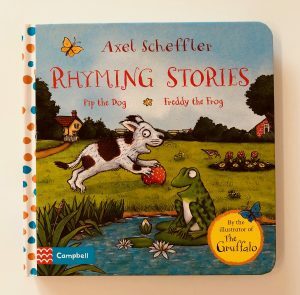 This brightly coloured little board book is perfect for babies and toddlers alike as it features a really strong rhyme and an array of really cute animal characters. There are two separate short stories in this one, each one about an animal who loves being noisy. The first is about Pip the Dog, who loves to bark all the time. He’s at his happiest when playing chase and woof-woof in the park but also enjoys scaring the local cats and even the postman with his loud bark! The second story is about Freddy the Frog, who loves to croak all day long and catch flies with his long tongue. He likes to play bounce in the pond with his friends but he’s also partial to a little nap on a lily pad.